I installed these with an S&S 640 EZ start cam. Both product installation and performance were as expected. The installation instructions were detailed and thorough. Thank you S&S for your support during bike week in Daytona! The technicians and staff at Destination Daytona were helpful and knowledgeable and took the time more than once to speak with me about my bike and the modifications. S&S roller rocker arms are recommended for use with cams having more than 0.585" of lift. Adjustable pushrods must be used with S&S roller rocker arms to obtain proper valve clearance. New rocker arm shafts are recommended for maximum performance and rocker life. All reference to H-D® part numbers is for identification purposes only. We in no way are implying that any of S&S Cycle’s products are original equipment parts or that they are equivalent to the corresponding H-D® part number shown. Adjustable pushrods must be used with S&S roller rocker arms to obtain proper valve clearance. 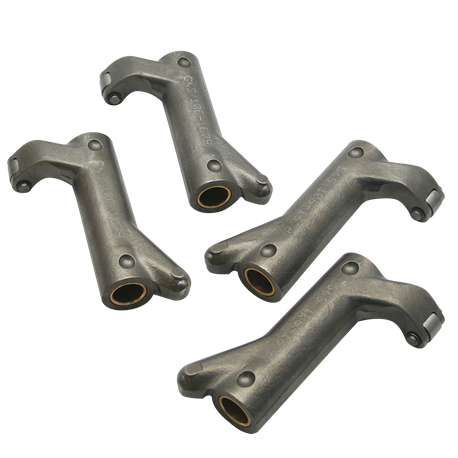 New rocker arm shafts are recommended for maximum performance and rocker life.